"Hawaii The Big Island Revealed"
Hawaii The Big Island Revealed by Andrew Doughty is the gold standard for Big Island guidebooks. It stands out from the crowd of hundreds of other books about the Big Island as being the best written, most painstakingly researched and most useful guidebook out there. I honestly feel like it would be impossible to say enough good things about the book. This book is so well known to Big Island residents and frequent visitors that it's become known as simply "the blue book". For me it fits all of the requirements for a guidebook that I outline in talking about why a Big Island guidebook is a good idea—It's comprehensive, fun to read, informative and personal. This book calls itself "The Ultimate Guidebook" and I'd have to agree. If you're going to buy just one book to help you enjoy your experience on the Big Island, make it this one. It feels more like you're getting advice from a friend rather than reading an encyclopedia. It's printed on nice glossy paper and full of color photographs and maps. Not every Big Island guidebook is and, really, who wants to look at black and white photos of Hawaii?!? Reading it actually makes me laugh out loud at times. 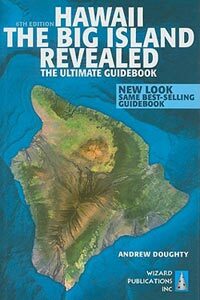 It's published by a Hawaii-based company that focuses on Hawaii guides. They use their own detailed maps created with the help of a powered hand glider! Reviews of businesses are candid and unsolicited. Hawaii The Big Island Revealed is available in stores on the Big Island but half the fun of reading a guidebook is the anticipation leading up to your trip, right? But it can be hard to find in your local book store, which may only have one or two (if any) Big Island guides from one of the bigger guidebook brands. Your best bet for a hard copy is to grab one online at a good price. But there's also the instant gratification option of a the Amazon Kindle edition, the Barnes & Noble NOOK edition, and the iBooks edition for your favorite Apple iDevice. Plus, just when I thought I couldn't find any more things to love about this guide, they've recently come out with an iPhone app that has some very useful features. It combines an electronic version of the best of the book plus interactive maps that use your iPhone's GPS to show your precise location. And the nice thing is that the maps are built into the app so it doesn't use any data, just free GPS location. This is a big plus for travelers from outside of the US who would have to pay ridiculous data roaming rates to use Google Maps on the go in Hawaii. While I've found this particular guidebook to be by far the best, there are a few other useful guidebooks and smartphone apps out there. For more on these, check out my reviews of other Big Island guidebooks and smartphone apps.